Provo • BYU quarterback Zach Wilson had surgery on his throwing shoulder last month to correct a condition that has plagued him since high school and will not participate in contact drills in spring camp next month. A BYU football spokesperson said Wilson, who appeared at center court during halftime of Saturday night’s basketball game against Loyola Marymount wearing a sling on his right arm, decided with doctors that it was in his “best interest long-term” to have the surgery a few weeks ago. Wilson completed 120 of 182 passes last season for 1,578 yards and 12 touchdowns, with three interceptions. 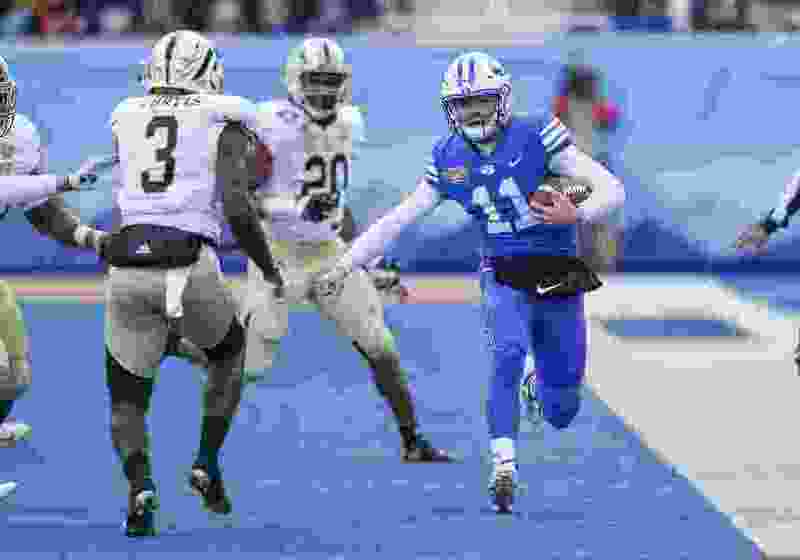 He was a perfect 18 for 18 and threw for 317 yards and four touchdowns in the Cougars’ 49-18 win over Western Michigan on Dec. 21 in the Famous Idaho Potato Bowl. The Cougars will open spring camp March 4. There is no timeline for when Wilson expects to begin throwing again. He apparently suffered the injury during his time at Draper’s Corner Canyon High and played through the discomfort the entire 2018 season, when he took over for senior Tanner Mangum and started the final seven games. When he took the microphone from captain and receiver Micah Simon on Saturday night, Wilson thanked the crowd and “Cougar Nation” for their support. Coach Kalani Sitake then thanked the crowd and referenced Russell M. Nelson, president of The Church of Jesus Christ of Latter-Day Saints, who was in attendance. Sitake did not mention Wilson’s surgery. Monday, offensive coordinator Jeff Grimes spoke on the BYU Sports Nation television show but offered few details regarding Wilson’s status. Grimes said he wasn’t sure how much Wilson would participate in spring ball. Maple Mountain product Jaren Hall, another BYU quarterback who will be a sophomore in 2019 unless he counts 2018 as a redshirt year, will presumably get more reps in spring camp in Wilson’s absence. However, Hall has been practicing with the BYU baseball team, which begins its season next week.